With most of my other projects in the paint shop it's time to start something new. 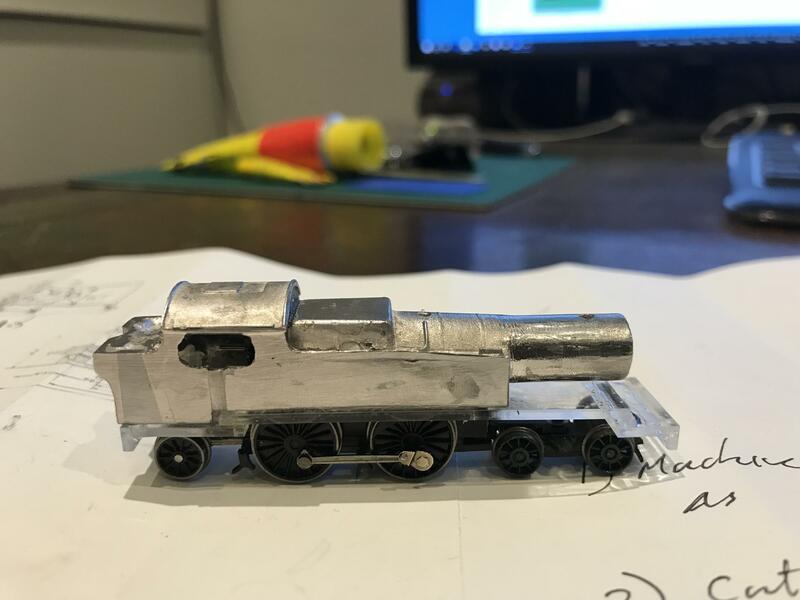 Regardless, there is another option which involves a degree of butchery and reconstruction of other similar GWR loco parts, and in this it is fortunate that the GWR reused boilers and other parts in various engine designs. First things first - the chassis and mechanism. 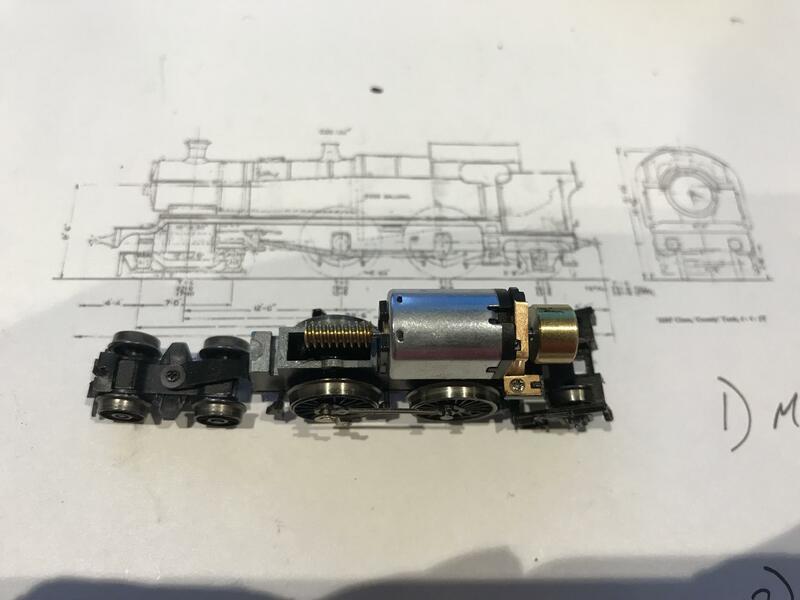 I realised some time ago that the Farish V2 rear drive wheel spacing and wheel diameter were the correct size and as the v2 mechanism is gear drive to the middle wheel set loosing the front driver pair would not affect running. This is assisted by the absence of traction tyres. 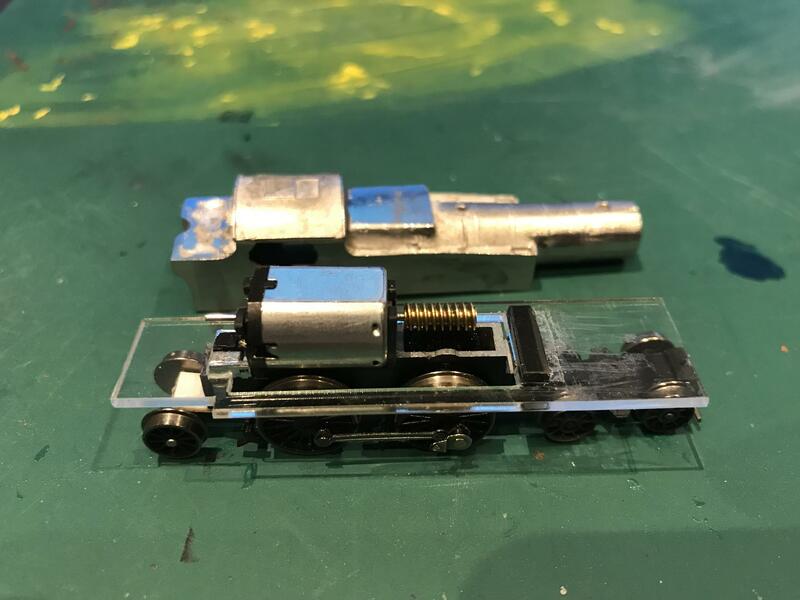 So to the first bit of butchery which I have completed but not tided up yet to cut off the front to a point where the front bogie can be hinged. A donor front bogie probably from a Jubilee is perfect. Here is stage one after the rough cuts and so far so good. The pickup plates are being similarly adjusted and wires added to compensate for the V2's well known atrocious arrangement of pickups In my ususal practice it will be a DCC loco and sound if I can find space for the speaker so good pickups are essential. 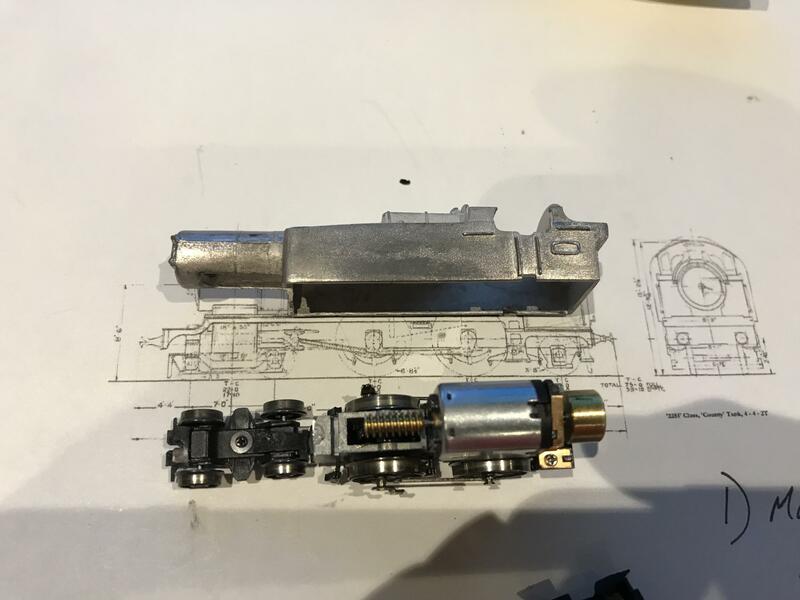 NB if I loose the flywheel it will fit and with DCC feedback electronic control it probably won't be needed. the body casting is very poor and will be stripped of features and fittings to be replaced with N Brass parts. In particular the boiler is 2mm too long at the front and the coal bunker is short and will also need to be extended down by about 3mm, however nothing insurmountable. I now have to decide if the chassis needs any additional screws for strength or hinging, and I need to add the trailing truck. Following this I need to reassemble the entire mechanism with wires to the pickups and wires to the motor to prepare for DCC and make sure it is going to be a reliable chassis before starting on the body. I have two problems with projects. Great to see you are getting on with this one. When to start is always difficult as I plan the entire build before I start and ensure I have everything I need. This build is an exception in that I would still like to find the Graham Hughes kit. That looks like a great project Snowwolflair. Have you thought about swapping the V2 wheels with some from a Jubilee to get closer to the correct diameter and see through spokes? I did but the Jubilee wheels require a different type of electrical pickup, and the V2 ones are so close to size they are fine. Really? I thought that both used wiper pickups. Either way, I'm sure that the County tank will be an awesome model! 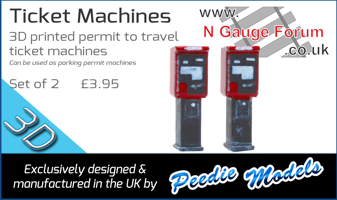 Yes they do but the V2 pickups are closer to the hub where the jubilee open spokes are. This looks like another great project that I will be following with interest. I'm very curious how you will attach the chassis to the body. The body is going to be a close relative to Frankenstein with bits from all over the place. As I build it there will be obvious points were a connection/screw or magnet can be used to attach the chassis. An afternoon of work and its taking shape. 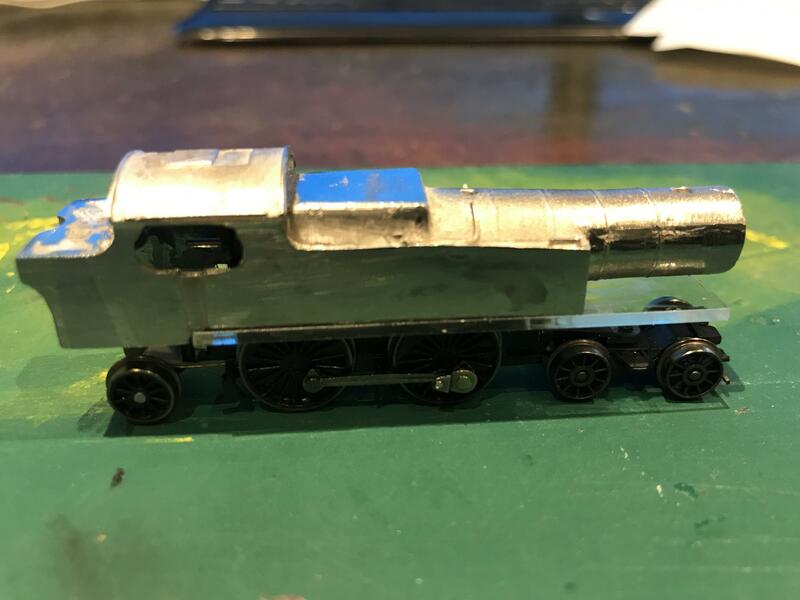 Starting with a Langley 56xx kit, I cut away the lower 2mm of the side tanks, carved out the firebox to fit the motor, cut off the bunker and soldered in side plates to lengthen by 4mm and the body is almost the correct shape. Next I calculated and laser cut in perspex the running plate, the first of three parts, and this is what I now have. It is true to the drawing and only 1mm too high which I will adjust later. The running plate will be attached to the chassis, and the body fitted by magnets. It looks a bit odd as the parts are transparent, however when I look at it there is a haze of cyanoacrolate fumes that allows me to see the shape. I am working from the wheels up and I am slowly assembling and tuning the chassis. 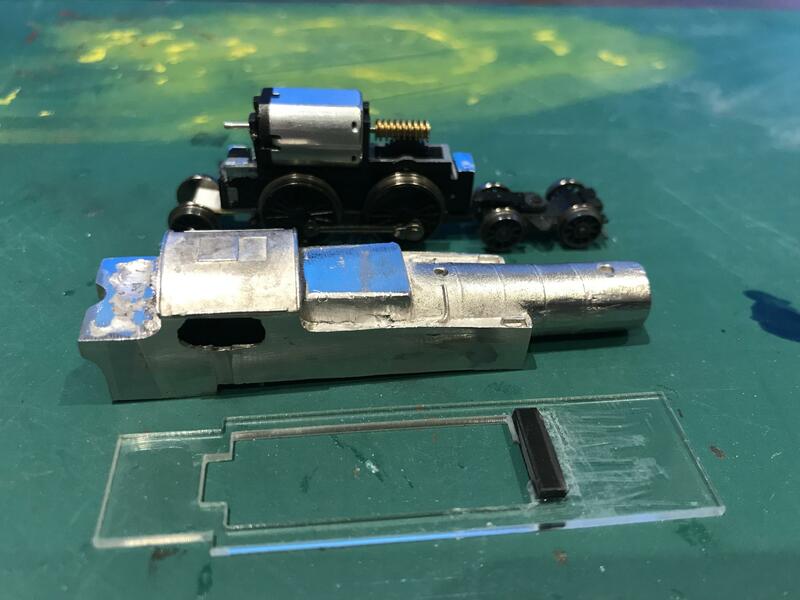 I have used modified cylinders form a Fairburn Tank and NBrass buffers. I spent some time hollowing out the back of the cylinders to allow tight corners without fouling the front bogie. As you can see from the video they are still catching on my test track but are fine on lesser radius track. The wiring is temporary as I will be fitting a sound chip very soon. The rear wheels need frames and a NEM coupling box fitted along with drivers steps. I need to fit mounting screws for the body and then I will be able to undercoat this part. The body has had the gross modifications and you can see the soldered in panel in the bunker side. I am going to file off a lot of the details and replace them with NBrass fittings as the white metal shapes are wrong or distorted. This will also allow me to file out or fill the moulding distortions and other blemishes, so a lot of work which is why I decided to make the separation above the running plate, with everything below fully functional, so when the body is finished and painted it will be dropped into place and the model will be complete. Wiggle fixed, sound fitted along with couplings and steam pipes.